What do an international fashion brand, a luxury development and an organic cafe have in common? They are all closing the loop by composting food waste with Subpod. From an inventor’s shed in the Byron Bay Industrial Estate this composting invention is gaining global attention for its innovative approach to processing organic waste. 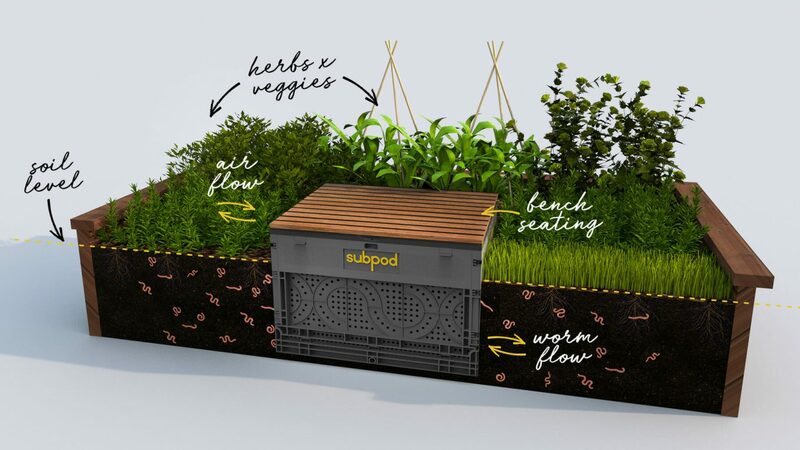 Subpod is an in-garden composting system that doubles as attractive garden seating and turns food waste into nutrient rich soil to grow food without the hard work, mess and odours of old school composting. It is powered only by worms and microbes and can be scaled from a single household to larger commercial applications. Developed in Byron Bay by Andrew Hayim De Vries, founder of ‘Compost Central’, on the smell of an oily rag, the patent pending Subpod system is now being used in backyard, eco resort, cafe, community garden and residential development sites in Sri Lanka, Byron Bay, Melbourne and Sydney. But closer to home, Subpod systems are popping up like mushrooms. And just up the road from Habitat, the international fashion brand Spell have just had their own Subpod garden system installed, after the original prototype at popular local eatery Santos Organics Cafe caught their eye. With the urgent global need for eco-friendly waste solutions, Subpod has captured attention with its ease of use and attractive design with enquiries coming from as far afield as Central Africa, UAE and USA. To date each Subpod Grow system has been built by hand and the company has not been able to meet the demand. That all changes on 21 March when the Compost Central Team launch a crowdfunding campaign to fund the commercial production of Subpod.